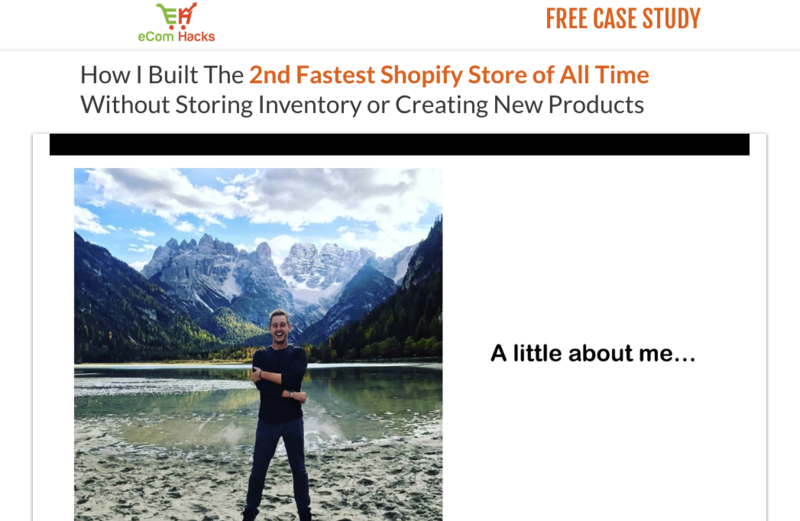 This is the first time I’ve came across Jared and decided to go ahead and register for his eCom Hacks case study from a Youtube video. It’s helped me generate a consistent 5 figures per month and helped thousands of others as well. It seems as though at the beginning of every presentation there is some sort of background story and social proof involved. You’ve got a few pictures of Jared traveling, enjoying time with his girlfriend, standing in front of his Lamborghini Gallardo, and a picture of his nice house. Most product sales videos such as income league open up like this are people over compensating for lack of quality in their product. I understand it’s important to show that you are actually making money and doing big things, and Jared didn’t get to carried away with it. From opening on how he went from broke to success (along with many failures) he jumps straight into the content. eCom Hacks Academy is a program based around e-Commerce, slang term being “e-Com.” It’s all about selling physical products online. Over the years e-commerce continues to grow at a record rate. Entrepreneurs are generating millions of dollars, Jared being one of them that is absolutely crushing it. He’s been featured in business publications and spoke at events around the world. and even shopify with all the competition and rising ad costs out there. It’s also raises questions to see so many popular YouTubers selling their E-commerce courses. Either they aren’t making a lot of money from doing e-commerce (so they are teaching it) or they genuinely want to add an extra stream of income and help people. I can’t say that Jared’s methods are 100% sound but I do believe that he’s right about everything he’s saying – Ecommerce is becoming harder and harder as time goes on. One of the biggest questions I ask myself when reviewing a product is where is the product creating generating their sales from. Is it from relationships they’ve built, social media following, or a list they’ve built over the years? It’s important to know this so you have real expectations as to what it REALLY takes to build a business online. So many make you think you’ll have results like them quickly with no real expectations. 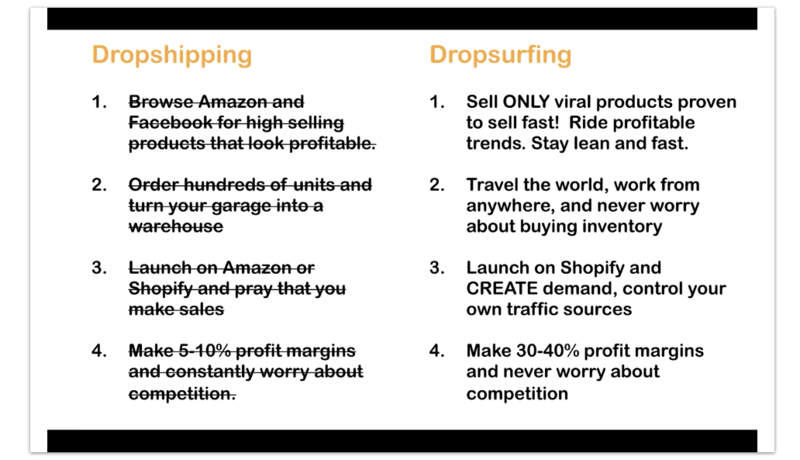 Also not relying on Amazon whatsoever..
With drop surfing you are riding on viral product trends. 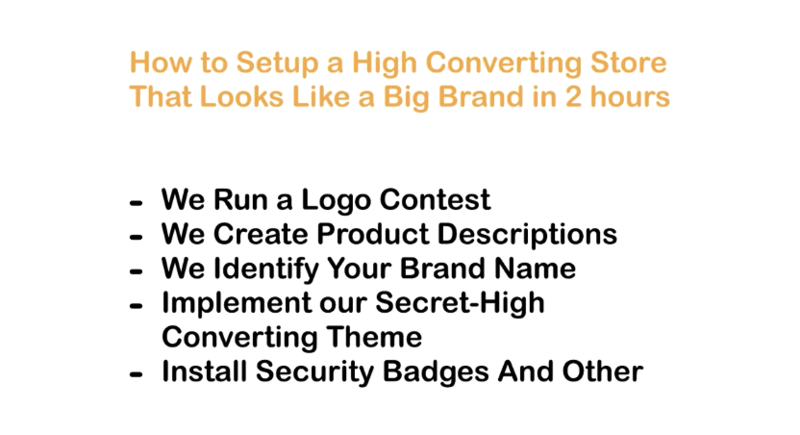 You are able to source these popular products rebrand them and resell them. There is little to no risk with this method because these are products that are IN DEMAND. For example – hover boards were big a few years ago and Jared was able to ride that trend and build a massive brand as a result of it. He eventually was bought out and sold off his brand for a lump sum. It’s a huge benefit to have the ability to travel the world along with unlimited amounts of time freedom. You launch your store on shopify, control your own traffic, have margins of 30-40% instead of the standard 5-10% you make with outdated models most are teaching. From what I’ve seen Jared has a simple and practical approach to making money with e-Commerce. Is eCom Hacks Academy A Scam? After evaluating Jared Geotz’ background I can be confident in saying his eCom Hacks Academy is in no way a scam. I’ve been doing this for quite some time now and I’ve got a good intuition when it comes to spotting the real from the fake. In fact I’ve done over 500 video reviews to date, in which 99% of them are negative. In this case I like what I’m seeing from Jared and it’s worth looking into. Like any business it’s not as automated as much as you may think. You have to make sure you’re keeping up with daily trends, source the trending products and most importantly, learn how to run Facebook/Youtube ads. It’s also hard to sell a brand based on 1 trend BUT, if you do a good job of branding other trending products under the same name that’s something that can sell well in the long run. Hopefully Jared explains more about this in his program. Lastly, is Jared still making a killing off of trending products? I would love to see a live case study inside of his program so that he can prove that its working well today and will continue to work in the future. I hope he’s not selling his program to make up for the loss of revenue in the ecommerce space. I still think the pros outway the cons. After all, he gives more away in his case study webinar than most gurus do in their paid programs. My gut tells me that eCom Hacks Academy is a quality product and Jared Goetz is a legit guy. At the end of his case study he asks people to fill out an application. My guess is that his team follows up with you and will sell you his program for at least $2,000 (if you’re a good fit). With that being said, if you feel like e-commerce isn’t a good fit for you, then feel free to check out my top recommendation for building wealth online. It’s my #1 pick out of all the products I’ve reviewed online. If you’re sick of scams and overwhelm and want to know what’s working for me when to comes to making money online check out my recommendation below. © 2018 JOSHELDER.COM - All Rights Reserved.